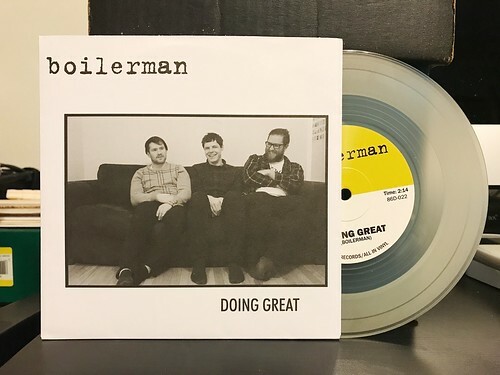 I Buy Way Too Many Records Dot Com: Boilerman - Doing Great 7"
This 7" sort got lost in the shuffle with some other records sent to me for review. It may sound silly, but my record piles still feel pretty disheveled since my Japan trip. It sort of feels like I'll never be able to catch up. I will try however, so today let's talk about this Boilerman 7". I've reviewed two other Boilerman releases, though this 7" seems to be older than the other two. I've said a few times that Boilerman is a band that's trying to mask their catchy hooks in some fuzzy yelling. The three songs on this 7" are much more straightforward and I may actually like them the most of anything I've heard from the band. Sure, things get a little crazy about halfway through "Doing Great," but that's only after the band has established a nice little guitar riff into palm mute verse with vocals that reming me a bit of middle era Plow United. "We're The Worst" is a crunchy blast of guitars and even their Warren Zevon cover of "The Factory" hits all the right notes. Boilerman are a consistently good band to check out, especially if you're in the mood for something a little louder. For over 15 years, EA Sports has released annual iterations of its most popular sports series, FIFA.